I recently wrote a post "Sick of comments with ads" after getting sick and tired of having to delete loads of spam comments everyday. However, quite recently I suddenly realised that I have not been receiving any spam comments on my blogs anymore. The apparent reason - Blogger has modified the comments page so that now, there is no url field to fill in. If you are registered with Blogger and signed in, the comment will include a link to your profile. Otherwise you can comment with a nick name or comment anonymously. I don't know why they left the third option as I know that most bloggers hate anonymous comments. Looking at the bright side, this move has definitely reduced the number of spam comments. On the other hand, I guess that this might put off a lot of bloggers who are now part of the "I Do Follow"movement. 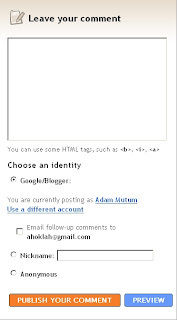 If you are not registered with Blogger, just leave a comment with your nick and your blog/ site url in the text. However, I still hate spam comments. I think it's yet another move on Google's part to force webmasters into their way of thinking. I know comment spam sticks but if you are using Wordpress, Akismet and the comment blacklist do a wonderful job og blocking spam comments. Plus, you can have a "dofollow" blog. At my forums, we had a nice list of dofollow blogs, unfortunately, we've had to remove all the Blogger and Blogspot blogs. It is now time for putting the registration option on for the readers to make comments. it will surely decrease the no of readers in a lot. but there is no other effective way of protecting the spammers.